As a loyal member, we believe you deserve that little bit more. We also want to show you just how important you are to us. 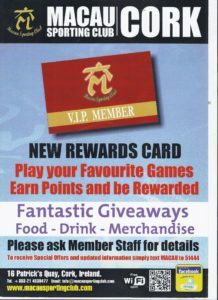 So we’re excited to tell you about our membership scheme, Macau Rewards. With a Macau Rewards Card ( which is your membership card also ) you collect points every time you visit. You can earn points on everything you spend and put them towards gaming, gifts, discounts and other great benefits. So keep your card handy so you don’t miss out on your points. Please ask any of our hosts /staff who will be happy to assist you.